HANNIBAL – In the Hannibal Central School District, progressive thinking, innovative strategies and a team mentality have taken hold since the implementation of the Strategic Plan last June. The plan outlines the mission, beliefs and goals for the district over the next five years, and has been fueled by the work of community members, teachers, students, staff and administrators. 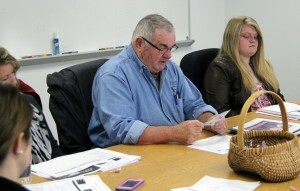 Hannibal Central School District Board of Education representative Jack Pope provides input during a recent Strategic Plan Committee meeting. On Feb. 11, the committee will update the school board on the plan and ongoing implementation efforts. The Strategic Plan Implementation Team meets monthly.to gauge progress, monitor successes, and review overall achievement. “This team is so impressive. Everyone is talking about strategies to make our schools and our community better,” said Superintendent Donna Fountain. For the committee members and outside consultant Penny Ciaburri, whose firm is working with the district to implement the plan, the progress so far has been measurable and is a reflection of the team effort that has been embraced throughout the process. The group is prioritizing its goals, examining strategies and developing action plans to ensure that goals are achieved. That research will be in the spotlight when the team’s findings and implementation strategies are presented during the Feb. 11 Hannibal Central School District Board of Education meeting. The meeting will begin at 7 p.m. in the high school boardroom. According to Ciaburri, the presentation will focus on the development of a data dashboard, community outreach efforts and alumni involvement. 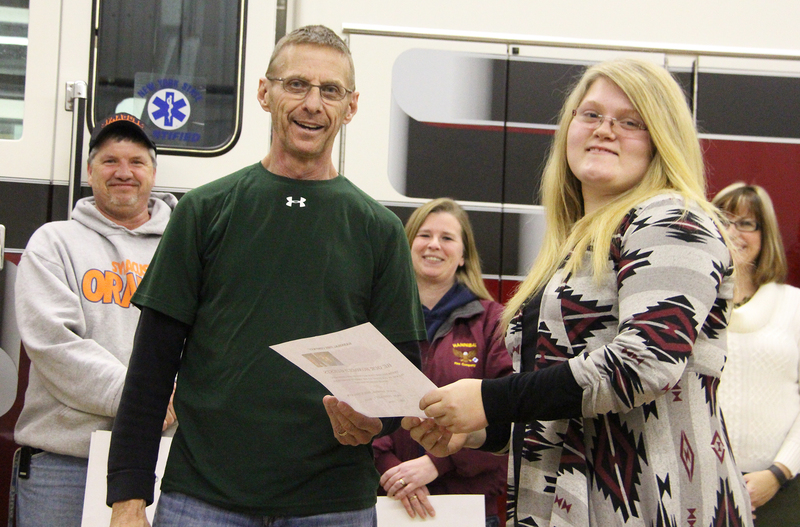 Student Kate Thompson recently visited the Hannibal Fire Company to invite firefighters to attend a Feb. 7 boys’ varsity basketball game, where the firefighters will be honored at halftime. Pictured, Thompson delivers an invitation to Fire Chief John Gombas. The community involvement piece is a key component in the plan, Ciaburri said. A recent effort to infuse the community into the school district was spearheaded by a student group. Students invited members of the Hannibal Fire Company to attend a boys’ varsity basketball game on Feb. 7, where the volunteers will be honored for their service to the community. The game is scheduled to begin at noon in the Hannibal High School gym. According to Director of Curriculum/Instruction and Special Programs Tammy Farrell, the idea to honor local groups stems from the Strategic Plan’s mission to spark involvement and strengthen the relationship between the community and the school district. Those efforts, according to students, will prove to be mutually beneficial.